All art was modern once. This is sometimes difficult for me to remember when, for instance, I stand in front of Monet’s Haystack series at the Art Institute of Chicago. To me, it seems perfectly natural for them to be touted as masterpieces in one of the world’s great museums. However, this was not always the case. Even Monet was rejected from inclusion the Royal Academy’s show in 1871, his works too “edgy” for their taste. I tend – like many people – to dismiss modern art outright. However, I used to do the same with country music, which I now rather like, so modern art and I might still have a chance at reconciling our differences. Therefore, it was with this hope-for-the-best-but-expect-the-worst attitude that I joined a lovely group of women (you know who you are) for a guided tour of a handful of Chelsea galleries. Enter our guide, the knowledgeable and gregarious Rafael Risemberg. Holding a PhD in Arts Education, Rafael runs the small company New York Gallery Tours, which offers both regularly scheduled Saturday public tours as well as private gallery tours. The lovely ladies and I met Rafael at the Sean Kelly Gallery to see a computer art installation by Anthony McCall. Before the art experience could begin, however, Rafael wanted to explain what we were to see over the course of our afternoon in Chelsea. By visiting the over 300 galleries that call Chelsea home and the hundreds of exhibits that come on and off their walls on a regular basis, Rafael had compiled a list of seven of what he considered to be the best shows in Chelsea at that moment. He explained that the art that you find in a museum is decades old at the very least, but the art of the gallery world is new. Not only is it new, it is meant to provoke, to challenge your very notion of what is art. Feeling fortified by the feeling of being “in the now” and with an expectation of the avant garde, it was now time for our first gallery show. Pulling aside a heavy black curtain, I immediately started the awkward, stutter-step walk that I employ when the lights suddenly go out and I don’t know if I’m going to run into an ottoman or a doorjamb. Arms outstretched in the black void, I hear Rafael say, “Don’t worry, you’ve got nothing to run into but other people.” OK, ottoman-free zone. Eyes finally adjusted to the darkness, I see two clear shapes projected onto the wall. 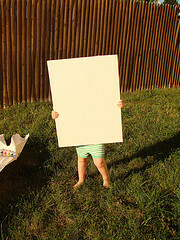 One shape – what would be a circle, except a piece is missing – is larger than the other. Well, wouldn’t you know it, that diminutive neighbor actually is the missing piece of the larger pie. I stare transfixed as the size of the shapes slowly alter, moving in tandem, one always completing the other. 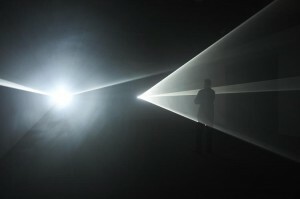 Meanwhile, the light from the projectors is infused with a misty haze that causes the beam to look 3-dimensional. Our trusty guide assures us that the chemicals used to create the mist aren’t toxic, but I’m not sure I believe him. I reach out to try and touch the misty beam like a stoner contemplating the deeper meaning of a toothbrush. I blame the mist. 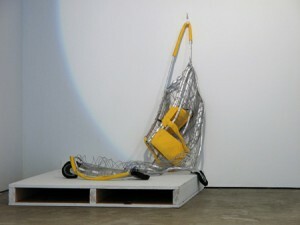 Installation View, Leaving (with Two-Minute Silence); Alexander McCall show at Sean Kelly Gallery; Photo by Jason Wyche. On to Gallery #2, otherwise known as the Bruce Silverstein Gallery. 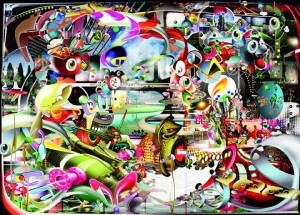 No trippy mood mist here, but there is the futuristic digital “appropriation art” of the German artist, Martin Denker. Drawn from images across the interwebs, my first impression is that these works look like sticker collections, only digital. Rafael explains that the artist is trying to create a response to the barrage of images from technology that has overrun society. If I messed that up, which I most likely did, I apologize. Whatever the message, walking around the gallery, the bright colors and Where’s Waldo-like fun of trying to identify objects within the clutter made this an enjoyable stop. 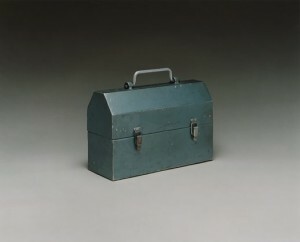 First panel from Mike Dickey, Tinsmith, 2000 by Sharon Lockhart. From far away these images succeeded in capturing the feeling of the Golden State: muscle cars, the swell of a cresting wave, golf courses, and even a portrait of Manson’s women. However, it was the detail provided by the maps that stole the show. A patchwork quilt of cartography, my mom found the location of her wedding reception amid the outline of a TransAm, while others found out they grew up a few miles apart from those same contours. The beautiful thing about this exhibit is that it succeeded where many a museum has failed: it enabled connections and interaction. People were not just taking in the images, they were processing them and giving back to the artistic experience. There were a thousand stories to be told in those collages, and you didn’t need an audio guide or wall plaque to tell them. Kara’s Wave. 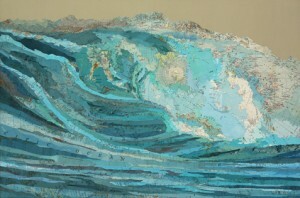 By Matthew Cusick. Margaret Thatcher Projects had paintings. Alas, these were no ordinary paintings. These were 3D paintings. 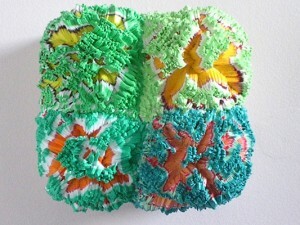 Colorful Koosh balls of pure paint shoved through the canvas from the back. Round geodes with fissures of color, cracks exploding with oranges, blues, reds, yellows, and a million other hues. It took all of your effort to stop yourself from reaching out and squeezing them. It’s one of those you have to see it to believe it type of exhibits, and really, you should see it. Vadim Katznelson, check him out. Like Green Plants by Vadim Katznelson. The Daniel Reich Gallery showcased the consumerist commentary of Christian Holstad. Wilted shopping carts expressed both the fatigue society feels from constantly buying things as well as the symbolic wind leaving our sails as the recession set in. There were also paintings that I refer to as “Trashcan Testimonials.” Essentially portraits of people, minus the people. Trying to convey the belief that you can tell a lot about a person by what they throw away. To be perfectly frank, I wasn’t that interested. However, we were shortly off to our final stop of the day. The Road to Hell is Paved (Best Buy) by Christian Holstad. Pace Wildenstein is one of the more well known galleries in the world, and they were featuring the work of one of the “hot” artists in the world today. Rafael informed us that Zhang Huan got his start by covering himself in honey, going into an outhouse, letting the bees or some other flying critters swarm his face, and videotaped the experience. Wonder what the 1871 Royal Academy would have thought about that? Not being a big fan of bees myself, I was relieved to see that this exhibit lacked insects of any variety. 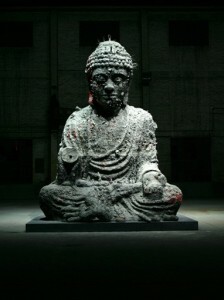 It was a peaceful, almost stark, and seemed kind of normal for such an “edgy” artist – and this with a giant Buddha made of ash in the center of the gallery. The black and white paintings, drawn from scenes from the mythology of a 7th-century Chinese prophecy book, were given a greater amplitude of interestingness by the unexpected use of feathers. It seemed fitting to start with a strangely soothing computer art installation and end with a modern twist to centuries old religion. And so concluded our gallery tour of Chelsea. We bid adieu to Rafael, who through his insight and clear passion for the work, had made the trip informative, provoking, and downright fun. The shows we had seen had done exactly as Rafael had promised: they had been new, they had provoked me and my coterie of lovely ladies in both good and bad ways, and they had challenged at least my definition of art. 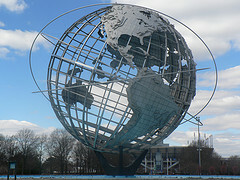 Using the popular Jules Verne novel, Around the World in 80 Days, as inspiration, a spitfire investigative journalist by the name of Nellie Bly approached her editors at New York World with a challenge. What was this challenge? Why, she would try to complete an around-the-world trip in 80 days, or, if she could manage it, in fewer. So began Nellie Bly’s record-breaking journey around the world. In spite of days of delays and other travel complications, she arrived back in New York City in 72 days, 6 hours, and 11 minutes. Her journey was followed with great anticipation: crowds awaited her in Topeka, Kansas, cheers erupted upon her visit to Chicago’s Board of Trade, and fellow travelers in Hong Kong were aware of her pursuit before she even touched down. Even though she was on a deadline, she managed to fit in a visit to Jules Verne at his home in France. Her modes of transportation were as varied – train, ocean liners, carriage, catamaran, and rickshaw – as her destinations – London, Calais, Amiens, Brindisi, the Suez Canal, Aden, Colombo, Hong Kong, Singapore, Canton, Yokohama, San Francisco, Topeka, Chicago, and New York. Even though George Francis Train bested her time by a few short hours just months after her journey, Nellie Bly’s trip was a truly momentous adventure. Newseum (Washington, D.C.): A 4-D film in the Annenberg Theatre allows you to go undercover with Nellie Bly as she uncovers the horrendous conditions of an insane asylum – the work that made her famous before the around-the-world trip. Musee Jules Verne (Nantes, France): This museum reveals events and items that inspired the great author to write such books as Around the World in 80 Days, and subsequently Ms. Bly’s journey. London Transport Museum (London, UK): London was Nellie’s second stop of her journey. Stop in at this museum for their collection on Victorian Transportation. Sri Lanka National Museum (Colombo, Sri Lanka): Nellie gave enthusiastic accounts of her stay in Colombo, even comparing it to Newport, Rhode Island. Founded in 1877, this museum was around when Nellie passed through and houses art and artifacts that tell the story of the nation’s cultural history. Suez Canal: The Suez Canal opened to shipping in November 1869, just 20 years before Nellie set out. Given its newness, it is no wonder she was so excited to see it when she reached Port Said and Ismailia. The opening of the Suez Canal – as well as the opening of America’s Transcontinental Railroad – revolutionized international trade and transportation. Without these events, Nellie’s journey might not have been possible. Read Nellie’s Book, Around the World in Seventy-Two Days, which recounts her historic trip. So, with that, real life adventurers and armchair travelers alike, let’s journey forth! That’s no whaler…Putting a face to a medical miracle. It was a beautiful January day in New York City. With only a light wind blowing down Fifth Avenue to contend with, I left the quirky little boutique hotel that served as home for the weekend, and set off toward the Frick Collection. Momentarily flattered when a woman stopped me to ask for directions – there’s something strangely satisfying about not being seen as a tourist even if I was unable to answer her question – I was in a decidedly good mood when I reached the steps of the imposing mansion on East 70th. The Frick Collection, arguably one of the finest assemblies of Old Masters paintings around, is a museum created from the artistic treasures of robber baron and steel magnate, Henry Clay Frick. The museum is housed in the Frick mansion – built on an entire city block – that was constructed in 1913-14. Strolling through the home/museum, it seems impossible that people once lived among art of such caliber and quality, but it would sure be fun to try it out for a little while. 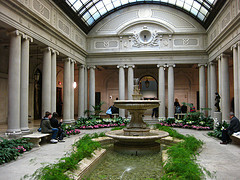 In the galleries of the Frick Collection you will find the gigantic canvases of Veronese, elongated El Grecos, a room full of frothy Fragonards, the quiet beauty of Vermeer, a gentle landscape by Corot, figures emerging from Whistler’s black backgrounds on one wall opposing the same artist’s studies in pink and white on the other, a healthy handful of Gainsborough, Rembrandt’s self-reflections, and much more. 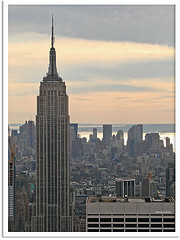 Can’t make it to New York? Well, lucky for you the Frick’s stocked collection is searchable through their online database. Holbein’s Sir Thomas More may be breathtaking in person, but it’s still pretty darn impressive on a computer. Although my journey to the Frick Collection lasted just over an hour, it was an extraordinary glimpse into the mind of a collector (even if he was the most hated man in America). The Frick succeeds not because of the quality of their artworks, which doesn’t hurt, but in the stories they are able to tell through their collection. I set off back down Fifth Avenue in an even better mood than when I started. I had seen great art, the weather was beautiful, the wind was at my back, and when the next person asked me for directions I was able to tell them where to go. c) incapable of producing anything worth hanging on a wall, but still like to look at other people’s art and support their efforts. If yes, then you should swing by the event – one part innovative fundraiser, and one part celebration of local artists in all their forms – going on at the Boulder Museum of ContemporaryArt this evening. This event is the annual Open Wall Party. Whatever your medium, whatever your skill, there are nails, hammers, some tables and pedestals, and, of course, open walls waiting for you to display your art. First come, first displayed, so make sure to get there before space fills up. Live music, featuring the talented Harper Philips and her ukulele (hear some of her songs here), and a cash bar help to create a great atmosphere for getting to know the artists in the Boulder area. The night’s silent auction of the works on display will benefit both the artists and BMoCA – and you’ll get to take home a completely original piece of artwork. The Open Wall Party at BMoCA is hosted by Elephant Journal, an eco-minded publication with the mission of “bringing together those working and playing to create enlightened society.” In addition to putting on a great evening, Elephant has also put together a room of local and eco-art pieces, and will be providing tips on how to “green”-ify your art studio. Where: Boulder Museum of Contemporary Art in Boulder, Colorado. * a $5 donation is suggested. 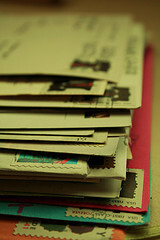 So, still seething from the information that my rent check got lost in the mail (I mean, come on, I even paid it early! 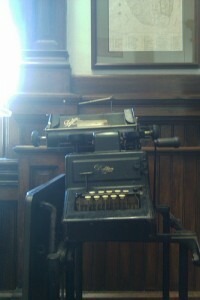 ), I popped into the Charleston Post Office to pick up a change of address form. 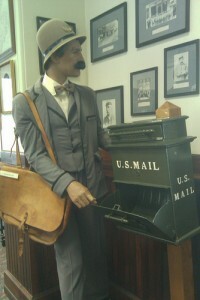 The wonderfully pleasant man behind the counter did quite a bit to put me back in a good mood, but what really turned my frown upside down was the unexpected surprise of a postal history museum. 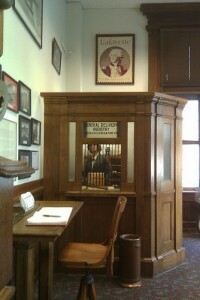 Complete with diorama and artifacts of postal service days past, this little gem of a museum was well worth the trip. Here you can learn about a brief history of the P.O. 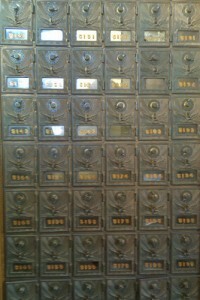 Box (apparently “pigeonholes” were being used as early as 1800) and look upon some Confederate letters and stamps.